So today was the Great Wall Day. I didn't thought about it and so spent a good part of the morning into the traffic jam. But in the end it was my lucky day as once I arrived in the Dongzhimen Road Station, I met with 2 great people (Claire and Sven) that also wanted to go to Simatai. 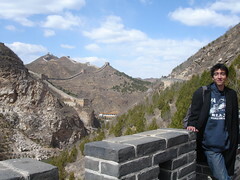 The Simatai site is an alternative to the much touristic areas (thus much crowded) of Badaling and Mutianyu. Simatai is located at 120 kilometers on North-East of Beijing. So the three of us took a car that drove us directly to Simatai and waited for us to return. Simatai is really a beautiful site to see the Great Wall, as the Wall here hasn't got many renovations and is therefore very authentic: some parts of it are no longer standing at all. AAAAhhh mon dieu le truc à me faire faire un arrêt cardiaque!! La tyrolienne ou le cristal de ttes mes peurs. As expected It hasn't come to your mind to introduced us your fellow news friends on the video (at least Claire^^)...Why didn't they take the Nobuta pose? !Why do you have to rotate every once and then your camera to a 90° angle? You're right a map is better on the blog than in a video. 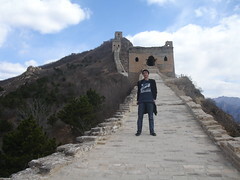 Besides the great Wall as comonly said...great...Greato!!! Nevermind just a auto-joke. > Why do you have to rotate every once and then your camera to a 90° angle? Because I'm not a professional cameraman!